Poly Produce Bins are now available from PolyMaster . 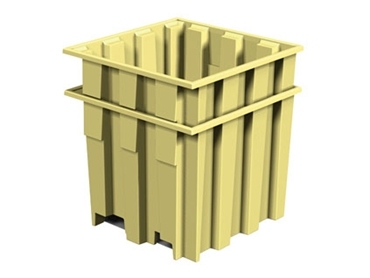 They are polyethylene rotomoulded bins which don’t require support frames because of their unique ribbed design. Poly Produce Bins are suitable for use in orchards, vineyards, market gardens, and abattoirs. They are also recommended for general materials handling situations. Poly Produce Bins can be nested when empty and stacked when full (weight limits apply). They are made from hygienic food grade material and they feature forklift access channels. The standard colour of Poly produce bins is Heritage Green, but they are also available in Mist Green, Dark Blue, Beige, Black, Wheat and Trans Blue.